Fort Worth, Texas — The tale in Cowtown on Saturday night, February 9 was one of two dynasties—one ending and the other just beginning. The 29th and final performance of the 2019 Fort Worth Stock Show and Rodeo (FWSSR) was the last professional rodeo performance to ever be held in the iconic Will Rogers Memorial Coliseum. First opened in 1936, Will Rogers became the home of the FWSSR, after some major civic wrangling, in 1944 and has hosted every performance since that time. 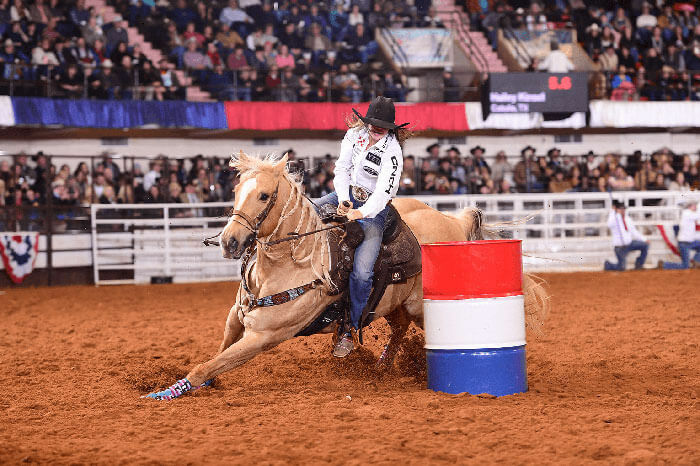 In the Women’s Professional Rodeo Association (WPRA) barrel racing, the 2019 Fort Worth champion could very well be in the early stages of building her own dynasty in the sport. 2018 WPRA World Champion Hailey Kinsel burst onto the national stage just about two years ago. From winning the first Gold Medal at the Salt Lake City Cowboy Games and Rodeo in 2017, to setting a new arena record and earnings record at her first Wrangler National Finals Rodeo that same year before storming through the 2018 season en route to her first WPRA World Championship, Kinsel and her phenomenal mare Sister look to be the dominant factor in the sport for some time to come. Another brick was laid in that foundation for Kinsel during the 2019 FWSSR. In Fort Worth, 210 WPRA barrel racers began the journey, each hoping to be the final cowgirl standing on the final night to claim the historic win. After one go round, 70 cowgirls advanced to the progressive round, held during the final seven perfs prior to the short round. Kinsel kicked off her Fort Worth run with a time of 16.68 seconds, good enough for 21st in the opening round. She returned to Will Rogers on Friday afternoon during the 26th performance. Tightening up her first corner Kinsel shaved three tenths off her first time for a 16.33 second run. The run put the cowgirl to the top of the second round leaderboard, helping her jump all the way to third in the average. Her two run total of 33.01 trailed only Sydni Blanchard and Jennifer Sharp. Blanchard had won the first round with a 16.22, the fastest time of the rodeo. Along with Kinsel and Sharp, she ran in the Friday matinee, posting a run of 16.51 seconds. Sharp and her mare Smooch continued to impress. After winning third in the first round, her time of 16.36 was just three one-hundredths behind Kinsel to put her second in the second round. Michelle Alley topped the Friday night perf to advance to the short round. Riding Saucy, Alley was 16.53 seconds. On Saturday afternoon, former Fort Worth champ Ivy Conrado punched her ticket to the short round with a run of 16.61 seconds. It was the second best of the performance behind Nevada cowgirl Mindy Goemmer, who ran a 16.58 on her mare Fancy. Conrado’s two run total of 33.19 landed her in a share of eighth. With the field set for the Championship Round at last, cowgirls had just a few hours to prepare between the matinee and the finals on Saturday night. Blanchard’s lead over Sharp was just eleven one-hundredths of a second with Kinsel lurking about two tenths behind her. Only fourteen one-hundredths separate fourth ranked Taylor Langdon to the bottom hole of 12th into the finals, Alex Lang, who held the spot by just two one-hundredths over the 13th ranked cowgirl. Because the committee hand rakes after every cowgirl, the finals is ran slowest to fastest, allowing the drama to build towards the championship as each lady to take her turn down the famous long alleyway has a better shot than the cowgirl before her to clinch the title. As the 12th place qualifier, Lang was first to take her shot on Saturday night as the barrel race got underway. Lang’s turn around the Coliseum netted a time of 16.89 seconds. 2007 Fort Worth Champion Brittany Pozzi Tonozzi came next. 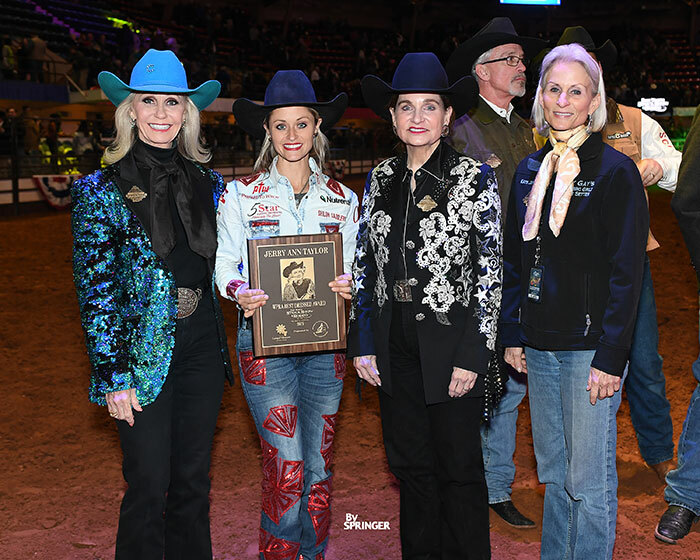 Riding on her birthday, the two-time World Champion had already won a second place check in San Antonio earlier in the day before heading north, switching horses and running in Fort Worth. She took the early lead with a time of 16.57 seconds aboard Mona. Alley came up the alley next and stole the lead from the champ with a run of 16.56 seconds but was soon undone herself by the very next cowgirl, Conrado. With her beautiful mare JLo’s braids flying, Conrado stopped the clock at 16.51 seconds, giving the number two ranked cowgirl in the WPRA World standings the lead. Again, the crowd erupted as the leaderboard changed, staying palomino but moving over to 2018 WPRA Rookie of the Year Jimmie Smith on the very next run. On her mare Lena, Smith ran out to 16.45 seconds. After the hot start, times cooled down in the middle of the pack. WPRA regular season earnings record holder Tiany Schuster looked shiny in her navy sparkles—keeping her in the running for the Jerry Ann Taylor Best Dressed Award—but had a little misfire into the first barrel on her gelding Show Mance, landing her time at 16.90 seconds. Prairie Circuit Finals champ Dona Kay Rule is already inside the top 20 of the standings in the early going of the 2019 season but she was unable to capitalize inside Will Rogers on Saturday night. A miscommunication put her and horse Valor on the wrong side of the second barrel, dropping them from contention though the duo looked sharp as they vied for the Best Dressed Award as well. Following Pozzi Tonozzi’s tracks from San Antonio, Hillman ran next aboard the palomino called Sherlock. Decked out with sparkling red blotches all over her outfit, Hillman also got a little off-track through the course, ending up very wide at the third corner. Despite not winning the Fort Worth championship, Hillman had plenty of reasons to smile after being awarded the Jerry Ann Taylor Best Dressed Award and the corresponding $5,000 cash bonus. Along with the money she won for winning the unsanctioned Rodeo X competition right before the rodeo began, Hillman pocketed $15,000 in bonus money in Will Rogers in 2019. Aubrey, Texas cowgirl Taylor Langdon got the barrel race rolling back the right way as the next runner, stopping the clock at 16.84 seconds on Louie. The 6th ranked cowgirl moved to fifth in the average with three ladies to run. Then came Kinsel. The Cotulla, Texas cowgirl was the Reserve Champ here a year ago, missing out on the title by just one one-hundredth of a second to Amber Moore. As Sister swallowed up the first can, Kinsel was in the hunt. Two more quick—and very tight—corners followed suit and the blue leaderboard had a new name at the top. Kinsel’s 16.36 took the round lead and put her more than two tenths ahead of Smith in the three-run average. As tough as the champ looked, no one has been hotter since January 1 than Montgomery, Texas lady Jennifer Sharp. Riding Terri Lamp’s mare Smooch, Sharp has blasted to the standings lead with more than $22,000 in earnings along with a championship at the National Western Stock Show in Denver, the first major rodeo of the winter. Sharp was second to last to compete and made a great effort to catch the reigning World Champs. Her time of 16.58 seconds landed just outside the money in the round but allowed her to sit second behind Kinsel by just five one hundredths of a second. The stage was set for the final lady . . . would Kinsel be bridesmaid again in 2019 as she was a year ago? Would Blanchard pick up her first FWSSR win? Unfortunately, the answer came in the wrong dramatic fashion as Blanchard and Heartbreaker slipped badly on the approach to the first barrel. The mare’s belly hit the ground and as she recovered her footing, she knocked the first barrel over, eliminating Blanchard’s championship hopes. Though she finished outside the average money, her first round run was still the fastest of the event and was undoubtedly one of the prettiest and fastest ever laid down here in Will Rogers. Kinsel added another notch on her growing resume with the title. “There’s no question when a barrel race is this good, it has a lot to do with the arena and these fans,” she added. Kinsel added $16,771 to her career earnings and picked up the vintage Fort Worth champion’s buckle along with a bottle of Tx Whiskey and $5,000, the bonus given to all the winners here. Three cowgirls—Kinsel, Sharp and Smith—banked five digits in earnings while in Cowtown, thanks to the huge entries and even bigger committee added purse of $40,000. Sharp will maintain her lead in the standings for the moment having already banked more than $36,000 in 2019. Conrado stays on her heels in second with more than $28,000 won. Kinsel and Langdon will jump up in the standings as both ladies have now earned more than $20,000 in the new season. Following the barrel race, there was an emotional tribute to Will Rogers before the bull riding closed out the rodeo. As the video filled with memories played, the interior of the dome and the rafters, which have always been filled with red, white and blue banners, were lit up as the crowd waved the lit flashlights on their cellphones. It was a bittersweet moment for fans, workers, crew and cowboys, many of whom have spent years enjoying rodeo in Will Rogers. The 2020 FWSSR will be held across campus in the all-new Dickies Arena on January 17 – February 8. For more information on the Fort Worth Stock Show and Rodeo, visit them on-line at www.fwssr.com.